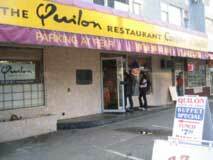 Quilon is an Indian restaurant located in Richmond. Not somewhere you’d expect an Indian restaurant given the large Chinese population. Almost unnoticeable on the bustling corner of No.3 Rd and Westminster, this little gem is tucked away next to a corner store and a rather indescript beauty salon. Not expecting too much and craving some Indian food, HW and I decided to take the plunge and try this place out.What a pleasant surprise! Prior to entering..guess what? There’s a slightly dated newspaper article proudly showing Quilon as number 2 in the Top 5 Indian restaurants in the Vancouver Province newspaper. Apparently they’re famous for their dosas. This was evident by the number of parties that were ordering it. However we did not have the chance to try this. The food was absolutely delicious. We had their butter chicken (which was a good benchmark item to compare to other Indian restaurants) as well as the chicken kashmiri. The chicken kashmiri was described as chicken with cashew nut in banana curry. We also had the appetizer vegetabe samosas. The portions we received were very generous and their prices were very reasonable. The food tasted very good and particularly liked the chicken kashmiri very much. Although similar to butter chicken in it’s smooth creamy feel, it had just the right hint of banana and cashew to make it stand out.